Fanatic hoops players take the court in any type of whether, clearing snow when necessary. 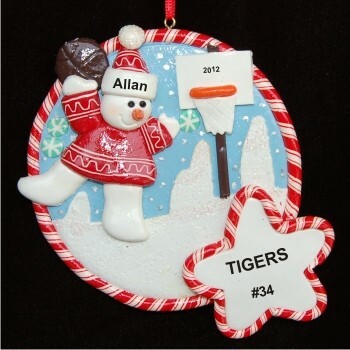 The snowy fun basketball personalized Christmas ornament is a darling way to celebrate your favorite basketball player whether they play on a school team, love pickup games at the gym or can be found year round in the driveway honing their skills. It's one of a series of sports ornaments we offer shaped like a medallion with a perimeter constructed from hand-braided polymer clay. We'll hand letter your custom details onto the snowy fun basketball Christmas ornament before shipping it on our classic velvet gift bag.